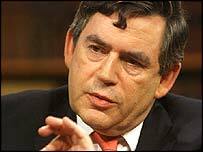 Gordon Brown defends his Budget as the Tories claim it is a return to Labour being a "tax and spend party". Have you gained or lost cash from the Chancellor's Budget? BBC economics editor Evan Davis looks for fat to cut. Should Brown wield the axe? Labour lays the grounds for the next election. A leading accountant gives her verdict on the Budget. How is the UK economy performing? Big business backs Brown's red tape fight, but smaller firms feel left out. Treatment of pensioners under fire despite an extra £100 for the over-70s.